Dow smoking on the East Bay bus 1964. We called him Dow. His family called him Terry, from the Terrence of being the III Berger. We last talked in 1985. He told me that he was meeting the Truman daughter, Margaret. Her mother Bess had been wooed by Dow’s grandfather Lester Dow Berger, decades before. She was writing a biography and wanted to know what Dow knew about his grandfather and her mother. He was excited about it. Prior to that telephone conversation, I had not seen him since 1968. He stayed with us, on “L” Street, in Madera after he was out of the Army. He had been in Korea. After a few of days with us he had to move on. We dropped him off at the 99 on ramp south of the Clinton overpass. He was about 6’ 3” tall with red hair and always wore an OD fatigue jacket. He had his Martin in a black guitar case, and his image reminded me of the Phil Oaks album cover. 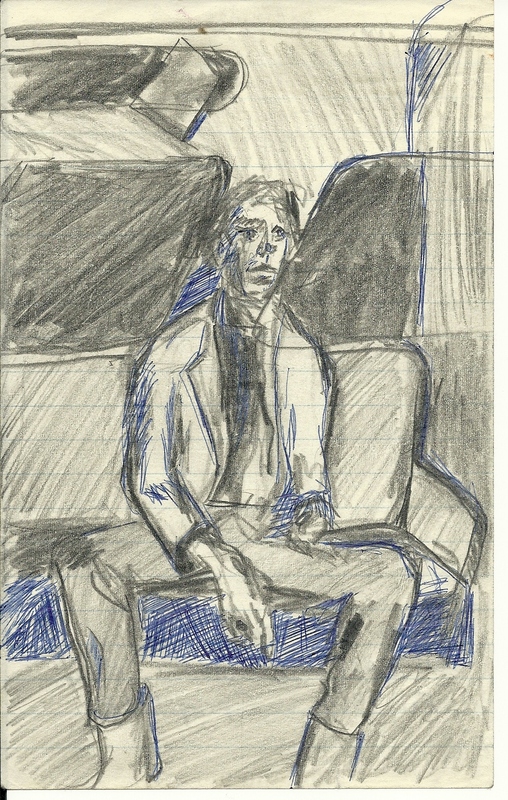 This sketch of him was on an East Bay Transit bus in fall of 1964. It was probably somewhere between Berkeley and Oakland. We lived in the same rooming house, Mrs. Darby’s at 4114 Gilbert Street, off 41st and Broadway in Oakland. Dow roomed upstairs on the main floor, and I was roomed with Gail Smith, from Davis, CA, in the basement, and with two other first year art students, a Kenneth and Jim, who were both from Chico High School. It was a few blocks to walk up Broadway and College Avenue corner, the location of California College of Arts and Crafts. It was a fine and crazy year. At some time in October or November Dow, Gail Smith and I moved out of Mrs. Darby’s and rented an apartment in the building on the corner of Broadway and 41st Street. It was the floor directly over George Kaye’s bar, which is still there. At some point we became friends with John Tyson, a fellow that worked with props and lighting on some play productions in San Francisco. His day job was at his father’s frozen meat company and distributor, from San Leandro. Dow wrote music and loved Bob Dylan. He aspired to be as great an entertainer. I was amazed with his guitar playing. He taught himself to arpeggio. It was beautiful listening to his playing. We all went down to an all night radio station in Berkeley one night. The station allowed people to sit in and play their music on the air. Dow wanted to do that too, but the night we went there, we either did not get there in time, or others were already lined up and performing, We watched those others for a while. They were a folk singing duo, and did a fine piece. They had a Peter, Paul and Mary sound. In January of ’65, we all moved to a College Avenue. It was about five blocks from CCAC. That move is a whole other story. That spring, he did play and sing at a couple different venues in San Francisco, but I did not attend. I don’t remember where. Maybe it was at a bar that let him sit in. Maybe another was an “open mike” thing some place. We were raised on different ends of the country. His stories of New Caanan are unforgettable. He taught me how to write research papers. I am not sure I contributed anything to his understanding. When he came to stay with me a few days over Christmas break, it was at the Roberts ranch place on Raymond Road in Madera. Dow thought it was an isolated desert wasteland, and could NOT understand how I lived there. We had a great time that year 1964 to 1965. If I had photos of him, I lost them in several moves and walking away in a divorce in 1970. This sketch is all I can find. The cigarette he smoked was and English Oval. He was a chain smoker that year. I am saddened by his death. We usually parted with a saying to each other of, “See you down that long dirt road.” For him not liking my Raymond Road experience, maybe he did get it after all. I wish I had another chance to visit with him. See you down that long dirt road, Dow. This entry was posted in Uncategorized and tagged 1960s, Art, author, Bay Area, California, college, inspiration, media, music, Oakland, populations, regional topics, songs, Story, Writer, writers, writing by timdesmondblog. Bookmark the permalink. Touched by your memorial of Dow, Tim. A Lot of memories. Lots of details. You should do more of this writing. I love it. I just found this on web page as a comment I have not moderated. Thanks. I know it was on Facebook too… I thought. Do you have Mom’s old Singer sewing machine? Replying late to this. Did not see earlier. Thanks for the reply and thoughts, and Youtube reference.